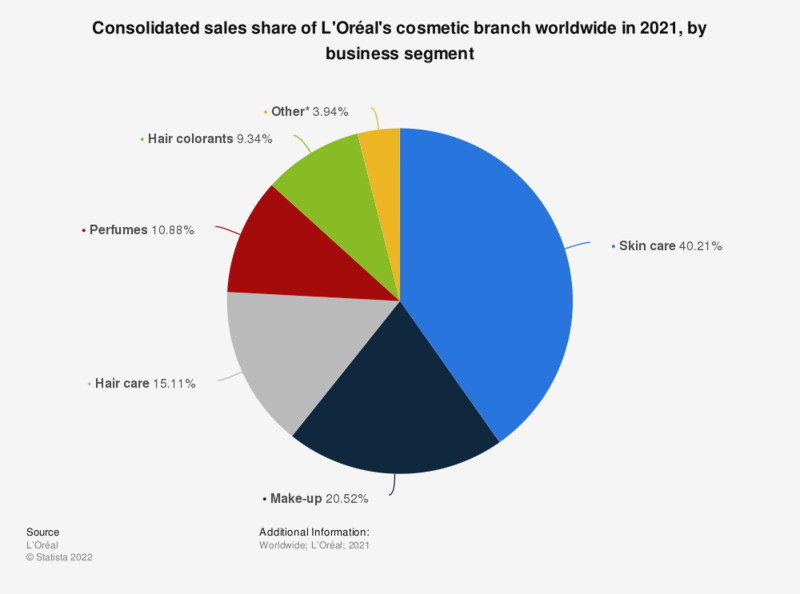 This statistic depicts the consolidated sales share of L'Oréal's cosmetic branch worldwide from 2011 to 2018, broken down by business segment. In 2018, skin care accounted for approximately 31.8 percent of L'Oréal's global consolidated sales. Since its foundation in 1909, the L'Oréal Group has devoted itself to one business: beauty. It enables all individuals to express their personalities, gain self-confidence and open up others. L’Oréal has set itself the mission of offering all women and men worldwide the best of cosmetics innovation in terms of quality, efficacy and safety. Providing access to products that enhance well-being, L’Oréal has made the universalization of beauty its project for the years to come. Fiscally, 2016 was a good year for L'Oréal on many fronts. The Group achieved strong sales and once again demonstrated its ability to outperform the beauty market, and to gain market share, even in the more difficult geographic markets of Western Europe and the United States. L'Oréal's cosmetic branch is primarily focused on skin care, hair care, make-up, hair colorants and perfumes with the branch's consolidated sales amounting to approximately 25 billion euros worldwide in 2016. The company did have a void in terms of addressing young consumers looking for affordable yet exciting color cosmetics, which Urban Decay is expected to fulfill. However, it needs to address its presence in the affordable natural/organic segment going forward. * Includes hygiene products as well as sales made by American distributors with brands outside of the Group.